Overshadowed by the high-octane wars over the Affordable Care Act and Supreme Court nominee Neil Gorsuch, the confirmation of Labor Secretary nominee Alexander Acosta is cruising toward a March 30 Senate committee vote with little fanfare. Yet Acosta’s acquiescence to President Trump’s labor agenda holds frightful if unheralded consequences for America’s workers, millions of them Trump supporters. Positioned as a kinder, gentler conservative than Trump’s first labor nominee, fast-food magnate Andrew Puzder, Acosta nonetheless has deep roots in Republican politics. He clerked for Supreme Court justice Samuel Alito (when he was a federal circuit court judge), and did prominent time in George W. Bush’s administration as member of the National Labor Relations Board (NLRB). He also held two top posts in Bush’s Justice Department. By numerous accounts, Acosta’s 8-month tenure at the NLRB displayed a mix of modest partisanship and occasional political independence. 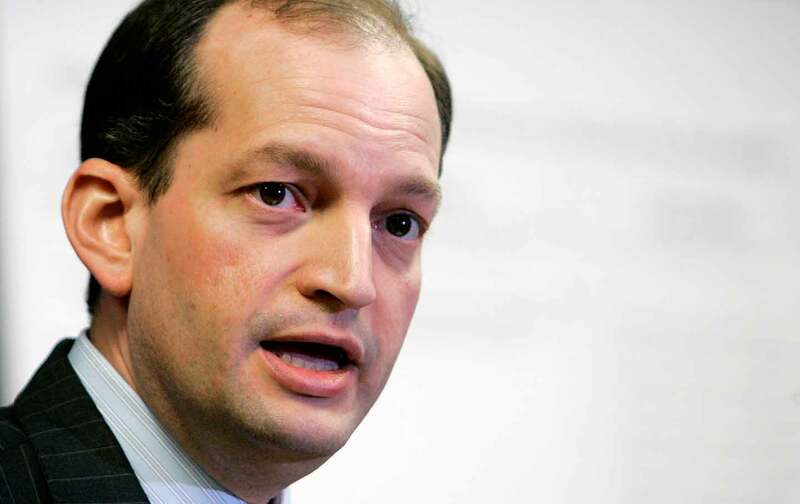 Although most of his decisions sided with the Republican majority on the five-member board, Democratic NLRB member Wilma Liebman characterizes Acosta as “independent, intelligent and not knee-jerk anti-union or anti-worker, or pro-business,” according to Politico. That may sound reasonable—but what does it mean for America’s workers if Acosta follows Trump’s direction? While Acosta is more qualified and less scandal-plagued than Andy Puzder, his comfort with Trump’s plans to radically diminish worker protections could harm millions of American workers. So what is the agenda Acosta will be charged with carrying out? Courtesy of policy “blueprints” from the Heritage Foundation—a top influence on the Trump administration—Trump’s proposed labor rollback is vast, and directly refutes his so-called “populist” appeal. If Acosta follows his boss’s direction, he will roll back Obama rules extending overtime pay for roughly 13 million lower-income workers. He’ll work with Congress to repeal prevailing-wage protections—meaning less economic security—for federal contract workers, many of whom will be building bridges and roads if Trump passes an infrastructure plan. A compliant Acosta would also eliminate job training and employment programs for low-income seniors, as well as for unemployed and displaced workers across the United States. And he would diminish an already enfeebled Occupational Safety and Health Administration (OSHA)—putting millions of workers at greater risk of accident and injury on the job. Acosta also deferred to Trump on his rollback of the Obama-era fiduciary rule aimed at protecting workers from receiving improper investment advice. The rule, slated to launch this April but now ensnarled in a six-month Trump administration “review,” would require retiree investment plan advisors to disclose any conflicts of interest. During the hearing, Acosta repeatedly voiced general agreement with principles such as equal pay for women (“to the extent that that pay gap is there, it shouldn’t be,” he said). Yet, under questioning from Senator Patty Murray he refused to commit to retaining the Women’s Bureau—a small but vocal $12 million Labor Department division “exclusively concerned with serving and promoting the interests of women in the workforce,” as the agency puts it. Acosta dodged, saying President Trump and Congress will have final say on that and other potential Labor Department cutbacks. Notably, when Acosta touted the Women’s Bureau, he emphasized its role in aiding women-owned businesses, not its work on equal pay and women’s poverty. Grilled by Democrats about Trump’s labor rollback plans, Acosta insisted, “Good jobs should also be safe jobs.” But if Acosta fails to push back on Trump’s huge proposed cutbacks in Labor Department funding and enforcement, that pledge seems dubious at best. For an up-close look at what these cuts mean on the ground, take Trump’s proposed elimination of OSHA training grants. For the relatively miserly sum of nearly $11 million a year, these grants provide safety training for workers in high-risk jobs—such as construction workers, meatpackers, and immigrant workers in many industries—in states across the country, including Trump-supporting Michigan, Nebraska, Texas, and Florida. These OSHA grants have trained more than 2.1 million workers in dangerous jobs since 1978, “lead[ing] to better protection that prevents injuries and fatalities,” says Debbie Berkowitz, who served as senior policy advisor and Chief of Staff at OSHA from 2009 to 2015. The trainings reach “workers who have never been trained before with vital workplace safety training that they use to make sure they are protected from job dangers—such as loggers, roofers, workers in landscaping and shipbuilding,” adds Berkowitz, now senior fellow at the National Employment Law Project. What this means on the ground is that Asian immigrant women with limited English get training to prevent harmful slips and falls in food service, home health care, janitorial, and other jobs. It means that largely Spanish-speaking workers in high-hazard industries such as construction and moving get trained to prevent musculoskeletal injuries. And it means small business employers and workers building communication towers get trained to avoid perilous falls. But even if Congress trims back Trump’s injurious labor cuts—hardly guaranteed given similar plans advocated by GOP legislators—many of Trump’s working-class and middle-class votes will be far less safe on the job. As it is, OSHA is limping along with fewer inspectors than it had in 1992—barely enough to examine each American workplace once every 145 years. As the Senate HELP Committee votes this Thursday and Acosta’s confirmation moves on, as expected, to the full Senate, his compliance with Trump’s radical labor rollback holds dangerous implications for workers across America. Trump-voting workers may want to take notice: the man poised to become the next labor secretary is primed to implement a profoundly anti-worker agenda that will harm millions of workers across America.